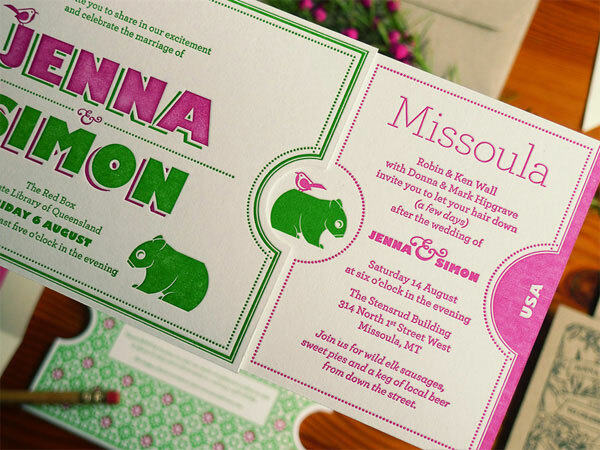 Jenna and Simon’s custom pink & green letterpress wedding invites are so much fun! As soon as I got a gander at them over at FPO, I knew that I had to share them over here. Jenna (the American bride) and Simon (the Australian groom) were getting married twice, on two continents and, of course, on two separate dates. The exception to the “two” rule was the wedding invitations, which they sent to all invited guests, no matter which ceremony they would be attending. 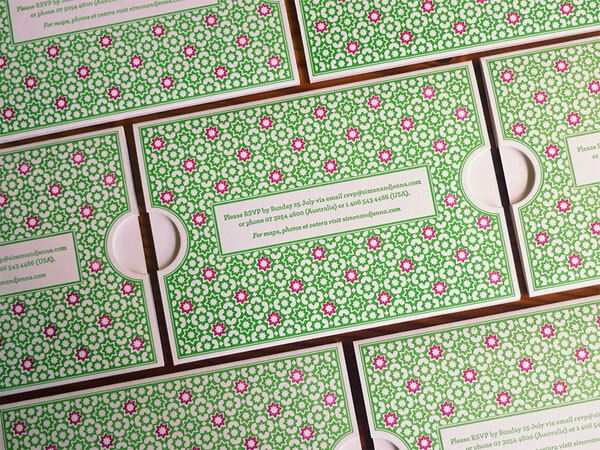 And what an invitation suite this is! 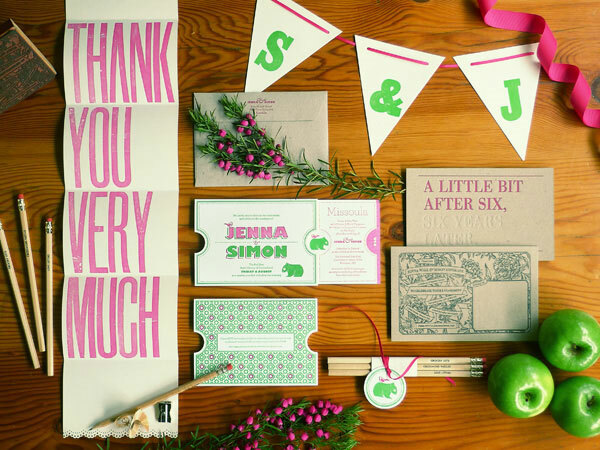 The hot pink and green inks (found vintage inks, no less) make these invites hard to miss, and why would you ever want to miss such letterpress loveliness? 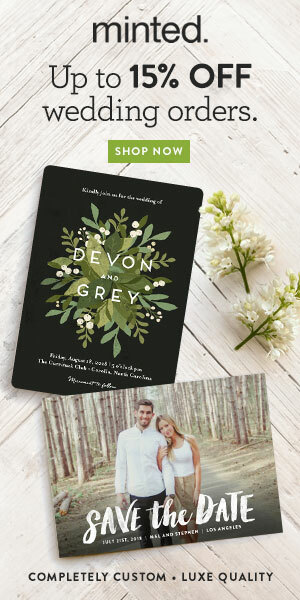 Couple the vivid color palette with modern typography, bold patterned RSVP sleeves (love! 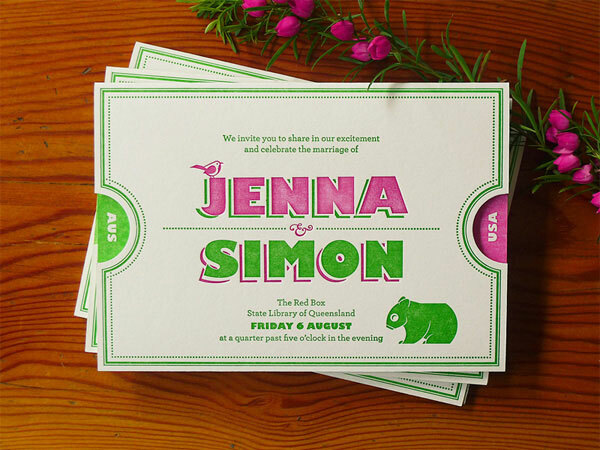 ), and cute illustrations of a wren (Jenna’s middle name) and a wombat (a quintessentially Australian counterpoint), and the result is an unforgettable letterpress suite filled with warmth and fun. Find out more about the process, and check out additional details from this suite, at FPO.